We love this swing because it’s a 3-in-1. This means that we don’t have a bunch of different baby “stuff” taking up space in our house, and this was important to me. I didn’t want to have a baby and suddenly my guests have no place to sit because I put the chairs in storage to make room for and bazillion different chairs, bouncers, swings for baby. I’m only kind of joking here. But you get the idea. This chair did it all and our baby spent a lot of time in it until she was about 4-5 months old. The seat comes out of the base and can be used on its own and the chair has a switch to make it vibrate, or it can become a bouncer if you push it. Having the portable chair was SOOO helpful to have in the first couple months, we would put her in the chair and bring her wherever we needed to go such as the kitchen, basement, bathroom, outside (it has a mini sun visor) etc. 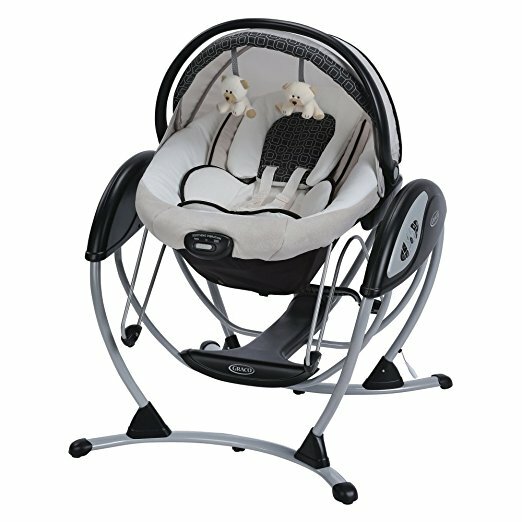 Then when you wanted her to sleep you could plop the chair back in the base which would turn it into a swing with addition features such as sounds (music/white noise) and several different swing speeds. I found this super helpful in the first few months as she could nap in there for a few hours—giving me back some ‘me’ time. And on top of all that, it looks very clean/simple and fit into my home décor nicely. That was a huge plus for me! !